A bookmobile frequently visited the little valley where I spent the first five years of my life. The closest "real" library was a good half hour across a mountain full of twists and turns, so the to the bookmobile was such a treat. I still remember stepping into the bookmobile, inhaling the smell of books and looking at shelves packed with books. I'd check some out and have my mom read them to me over and over until the next time the bookmobile pulled into the valley, and I could exchange them for more. Monica Brown's Waiting for the Biblioburro takes readers to a place far more remote than my little valley. Ana, a young girl, lives in a small village in Colombia. Because she only owns one book, she makes up her own stories and tells them to her brother. She has a beautiful imagination but longs for more books. Her wish comes true one morning when she sees a man ride into the village with two donkeys, one holding a sign that reads "Biblioburro." As children gather round the man and his donkeys, named Alfa and Beto, he tells them stories and allows them to check out some books that he's carrying on his donkey. While Ana is awaiting his return, she reads the books over and over again and is inspired to write her own story to share with children in other villages. 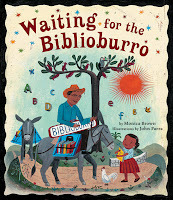 Waiting for the Biblioburro is based on the real-life story of Luis Soriano, a librarian who travels throughout Colombia and brings books and the gift of literacy to children living in the villages and mountains. The story itself is simple and heartwarming and illustrates the impact one person can have not only like a child like Ana but an entire village and country. Spanish words are sprinkled throughout the story, and a pronunciation guide and glossary are in the back. John Parra's brilliant folk-like illustrations give the story a sort of magical feel and offer glimpses of a simple, yet rich culture. 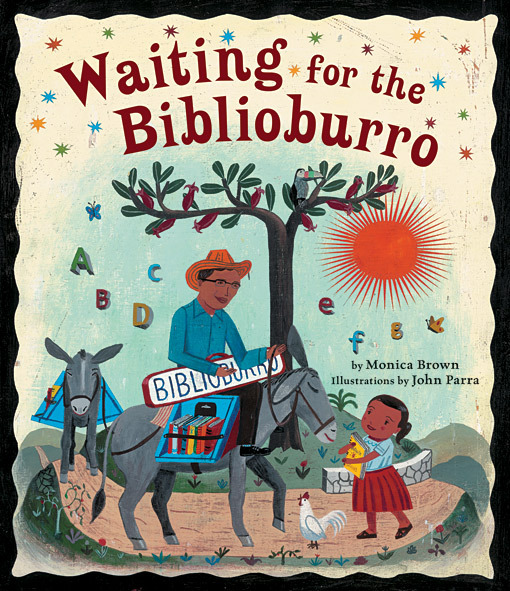 A portion of the proceeds from the sale of book go to Luis Soriano's BiblioBurro program.